Dr. Witten is an Associate Professor in the Neuroscience Institute and Department of Psychology at Princeton University. 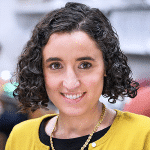 Her lab studies the neural circuits for reward learning and decision-making, with a focus on the role of dynamics and feedback in these cognitive processes. The work promises to provide important insights regarding how actions are linked to later occurring outcomes in support of learning, a central open question in the field of reinforcement learning. Dr. Witten received her PhD from Stanford University and completed her postdoctoral studies there as well.